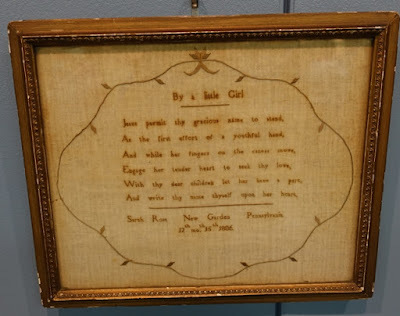 As I was sorting through old photos, I ran across these from the Warren County Historical Society Museum in Lebanon, Ohio. Taking photos was challenging due to overhead lights and flash reflections on the glass, but I thought you might enjoy seeing these photos anyway. 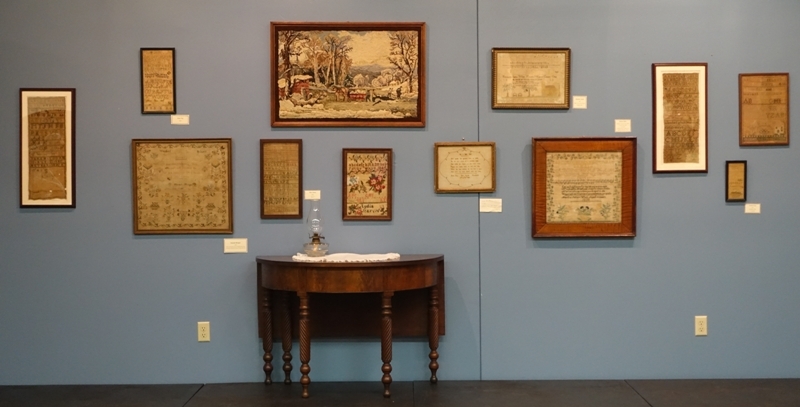 These are just a fraction of the samplers in the Warren County Historical Society's collection. In 2013, I showed some more photos from this wonderful little museum. 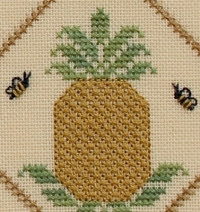 If you're interested, you can view them at http://withmyneedle-ellen.blogspot.com/2013/03/samplers-friends-and-hot-cross-bunsoh-my.html. You'll need to go about halfway down the posting to see the photos and write-up. Posted by Ellen at 2:52 PM 5 Notes have made me smile. My Needle's Worke Sampler Huswif is my third class for this year's Christmas in Williamsburg Needlearts Festival. The class will take place over three consecutive days. 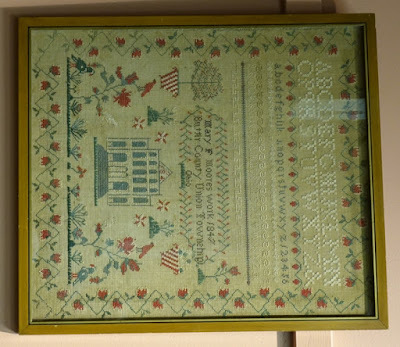 This project can be made as a sampler and framed or it can be made into a huswif. 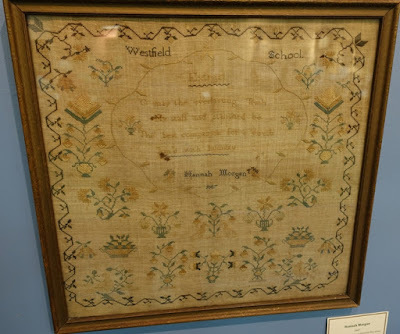 A "huswif" or "hussif" is a folded or rolled case for holding needlework supplies. Women often carried a huswif in one of the large tie-on pockets worn under their skirts. 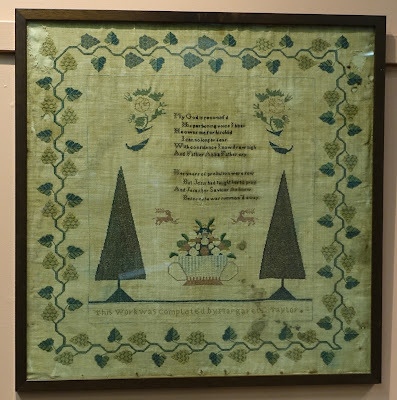 The embroidery is the same for both the sampler and the huswif. The project also includes a coordinating needlebook case and scissors sheath. All of these pieces can be assembled by hand. 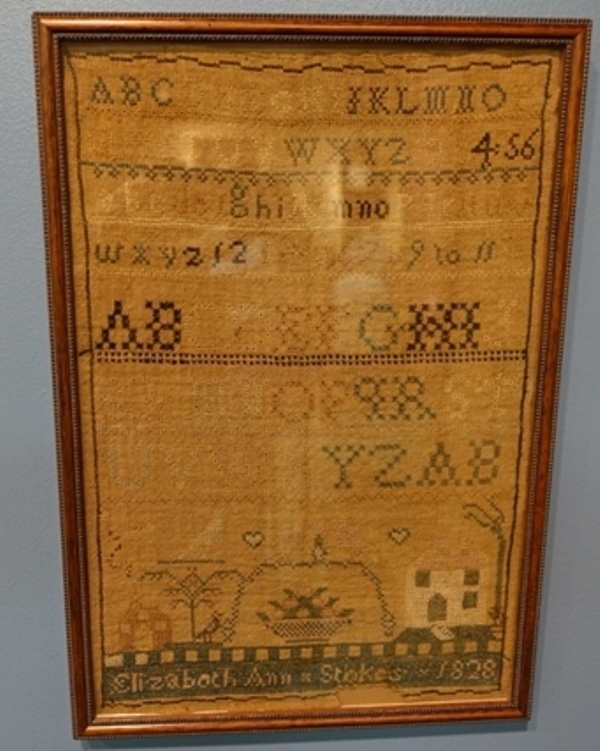 The stitches used are Algerian eye, alternating double backstitch, backstitch, barrier, Belgian cross, closed herringbone, cross, cross stitch over one linen thread, cushion (traditional and reverse slant), double-sided Italian cross, four-sided, long-armed cross, Montenegrin, mosaic, padded satin, Rhodes, rice, small plait stitch, Smyrna cross, star, straight, tent, Williamsburg, and zigzag stitch. 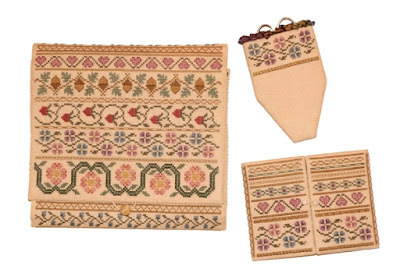 The kit includes charts and detailed directions for stitching and assembly, 36-count linen, silk embroidery threads, dupioni silk, a needle, and miscellaneous finishing supplies including overdyed silk ribbon, and three beads for closures. The scrimshaw ruler and threadwinders shown in the third photo are not included in the kit but can be ordered at the class. Registration for this class and others can now be done at Needle Art's Festival (click here). Posted by Ellen at 5:34 PM 3 Notes have made me smile. My second early bird class for the 2017 Christmas in Williamsburg Festival is Olivia and Her Sampler. 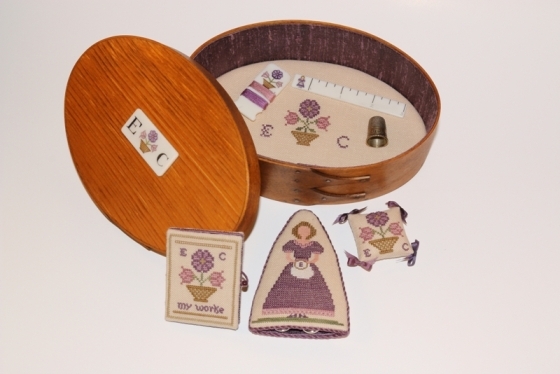 A handmade Shaker box will hold your needlework treasures. On the inside, the box features an embroidered bottom. Dupioni silk lines the walls of the Shaker box. 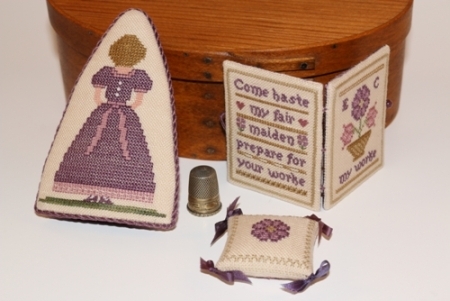 Also included are three needlework accessories -- a scissors case doll, a sampler needlebook, and a pincushion. The scissors case doll is perfect for storing your embroidery scissors. The case has a front and back view of a young lady, Olivia, with her embroidery work. You will be able to personalize your case with an initial on the linen in Olivia’s embroidery hoop. The needlebook is Olivia’s completed sampler. The second photo shows the back of the needlebook, scissors case doll, and pincushion. 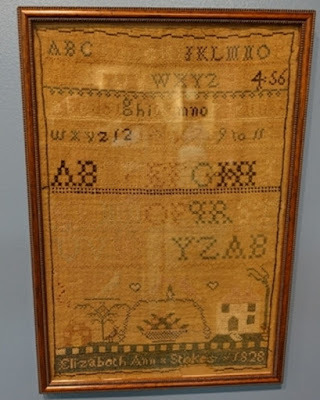 This project uses the following stitches: Algerian eye, alternating double backstitch, backstitch, Belgian cross, closed herringbone, cross stitch, cross stitch over one linen thread, double-sided Italian, four-sided, mosaic, nun’s, Smyrna, and tent stitches. In addition to the charts and detailed directions for stitching and assembly, the kit includes 36-count linen, silk embroidery threads, a needle, a wooden Shaker box, dupioni silk lining, and miscellaneous finishing supplies. The scrimshaw ruler, threadwinder, and personalized box label shown in the first photo are not included in the kit but can be ordered at the class. Posted by Ellen at 3:05 PM 6 Notes have made me smile. Remember me? I'm terribly embarrassed that it's been so long since I've last posted anything on my blog. Please accept my apologies. I've so much to tell you that it may take me weeks to catch you up on things. I want to start with some exciting news. I was approached a few months ago by Annie's to submit class proposals for their Needle Art's Festival (click here) this December in Williamsburg, Virginia. I was thrilled that they accepted all three of my proposals--two early bird classes and one regular class. Registration is now open for all classes. Today I'm going to show you one of my early bird classes, Be It My Ambition. 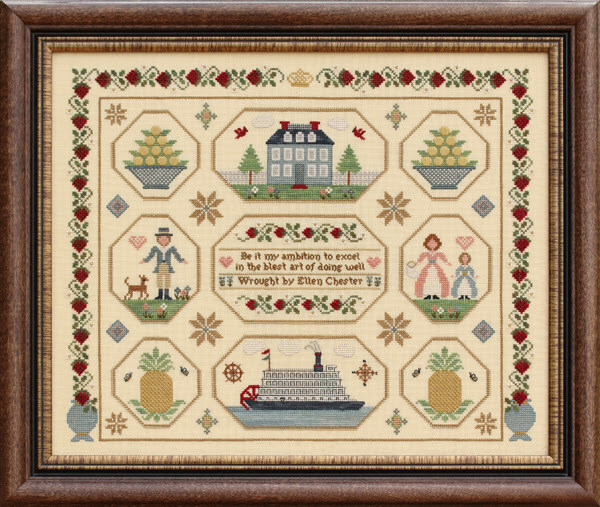 This compartmentalized-style sampler has nine octagonal cartouches surrounded by a luscious strawberry vine border. 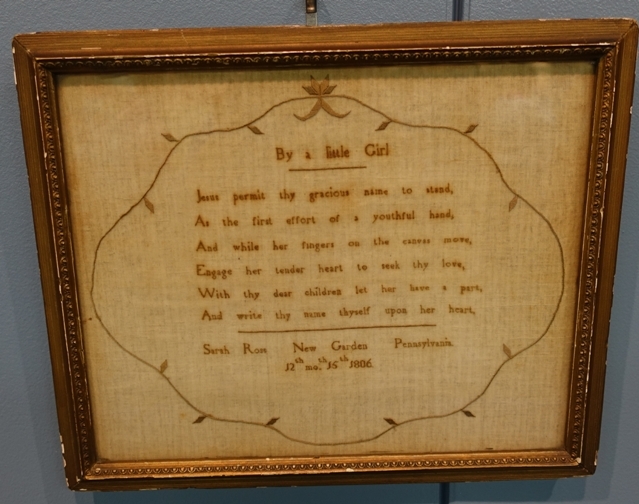 The center cartouche has an old sampler verse, Be it my ambition to excel in the blest art of doing well. 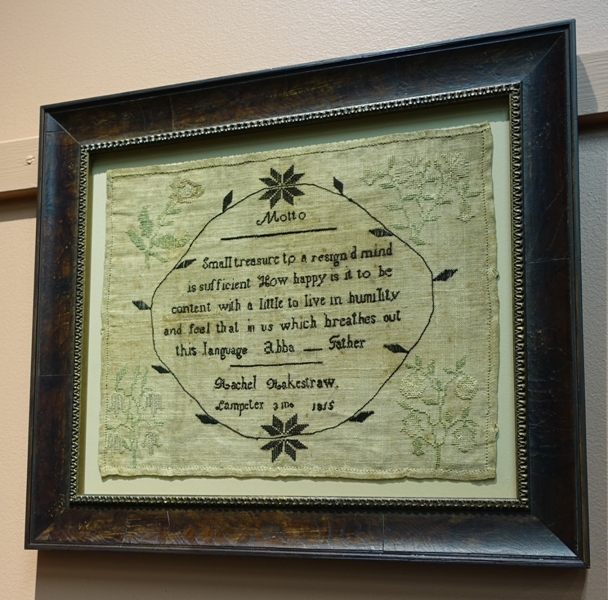 This is truly a sentiment we should embrace not only in our needlework but also in our lives. 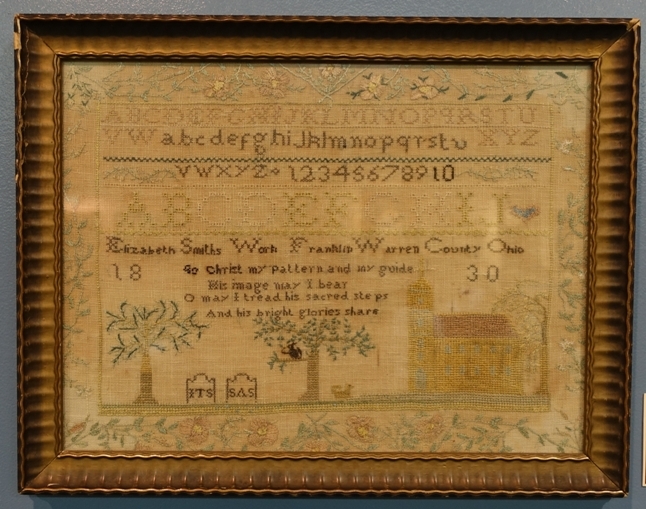 This project uses the following stitches: backstitch, closed herringbone, cross stitch, cross stitch over one linen thread, horizontally elongated cross stitch, mosaic, padded satin, satin, ray, Smyrna cross, star, straight, tent, and vertically elongated cross stitch. Your class kit will include charts and detailed directions for stitching (18 pages plus the cover), 36-count linen, silk embroidery threads, and a needle. 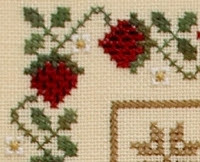 The use of specialty stitches adds a lot of texture as shown in the following two photos. 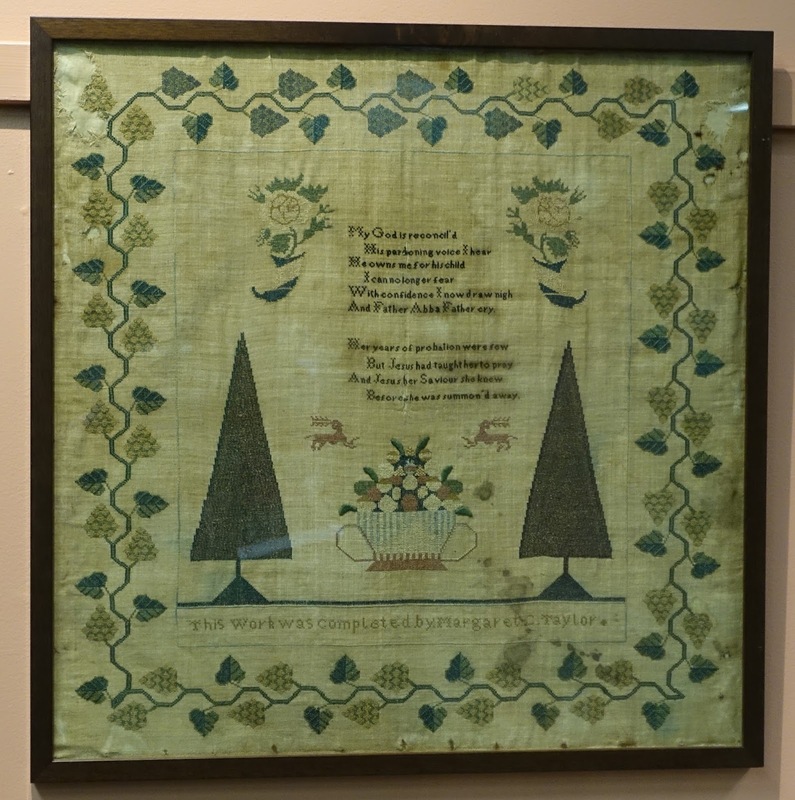 For many needleworkers, Christmas in Williamsburg is the dream needlework seminar. Can you imagine wonderful classes in such a beautiful and historic location? You can also explore the village during your free time. Colonial Williamsburg is a very special place to visit, and it's even more wonderful at Christmastime. I've been there often over the years, and I'm always excited to return. Don't worry about not knowing anyone if you're new to this seminar. As you probably know, needleworkers are an extremely friendly bunch, so it will be easy to make some new friends. If you don't want to travel alone, bring a friend, your daughter, sister, or cousin, or perhaps your husband. 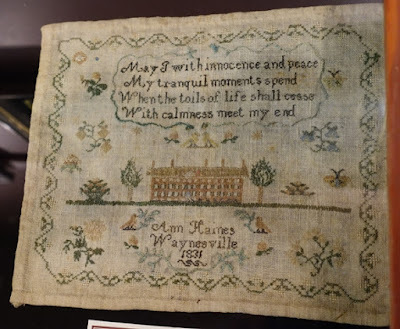 It will be great opportunity to indulge in your needlework passion, to explore wonderful Colonial Williamsburg, to renew old acquaintances, and to create new friendships with those who share your passion. I've enjoyed hearing from some of the needleworkers who plan to take one or more of my classes. I hope you too can join us for a fun time in Williamsburg November 30-December 4. Posted by Ellen at 12:11 PM 2 Notes have made me smile. A couple of weeks ago Tom and I spent the weekend in Battle Creek, Michigan with dear friends. What a wonderful time the four of us had! 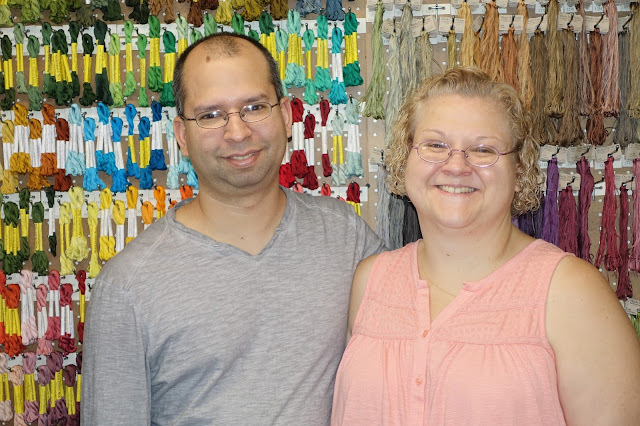 On our way home, we decided to make a slight detour to visit Bobbie and Cam at their shop Stitching Bits and Bobs in Plainwell, Michigan. What a treat that was!! Bobbie and Cam opened their original shop in West Memphis, Arkansas in February 2003 and attended their first Nashville Needlework Market about the same time. Bobbie told me that they had no idea what to expect so they drove to the market in a Ford Taurus. She said it was a good thing that they lived only four hours away because Cam had to pack things on and around her to get everything home. All you could see was her head. Obviously there was no stopping for anything (including a bathroom break). 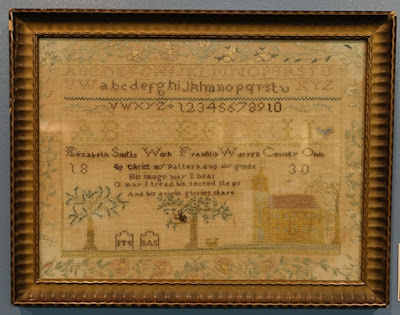 Wow--what we do for our love of needlework. 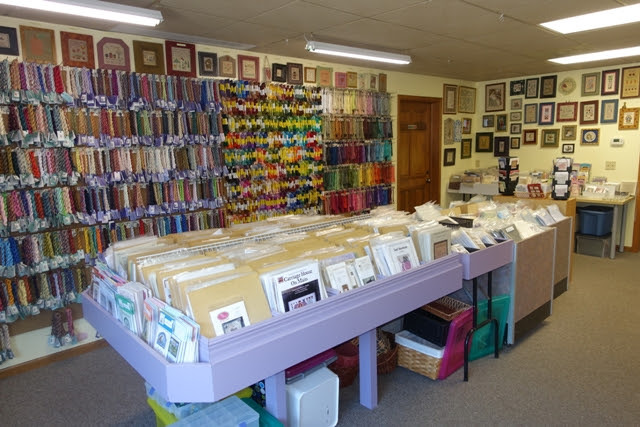 Here are some photos from one of the two large rooms in the shop. Look at all those fibers!!! Me: How did you get the name Stitching Bits and Bobs? Me: Please tell me about your shop and how you got started. Bobbie: We started out online only and originally thought we'd remain that way. Once our inventory started to take over the house we decided we needed a separate building for it. That is when we moved to Michigan and bought property that included a separate carriage house. We had our shop in the carriage house for about a year and then due to so many requests we decided to have walk-in customers too. 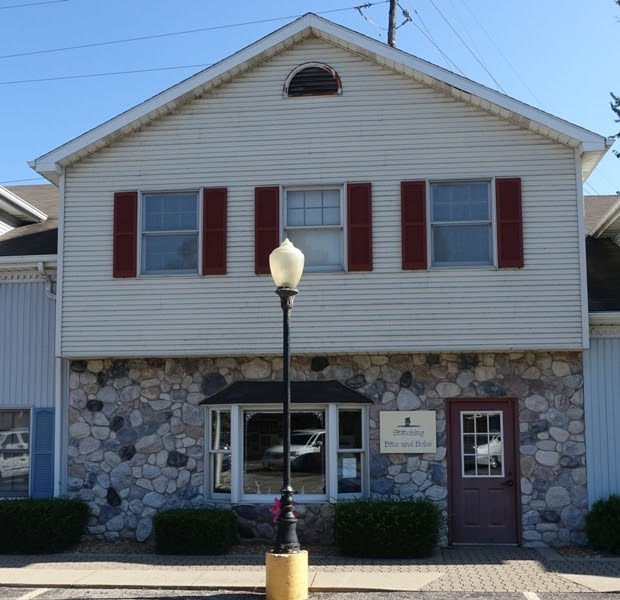 We quickly grew out of the carriage house and were lucky to find a retail space only four blocks away. We started out with 1200 square feet and within six months were able to expand into part of the space next to us which brought us up to 1800 square feet. Four years ago the business on the other side of us moved to a smaller space so we were able to expand again - we currently have roughly 3600 square feet. Me: I noticed lots and lots of fibers. Please tell me about them. Bobbie: Our shop has an extensive selection of fibers and I'm always finding ways to squeeze in a new fiber line! 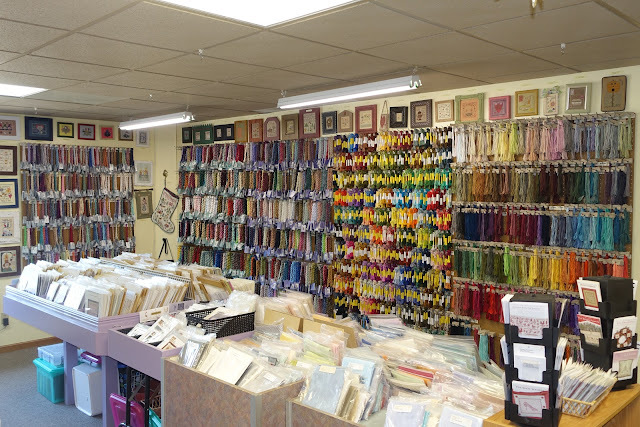 We carry threads from Dinky-Dyes, Rainbow Gallery, Gloriana, Needlepoint Inc., Thread Gatherer, Weeks Dye Works, Gentle Art, Classic Colorworks, Carrie's Threads, Tentakulum, and many more. Our most recent addition are the cotton and silk lines hand dyed by Erik Shipley of Ship's Manor Designs. Me: Tell me about the stitch-ins you have at your shop. 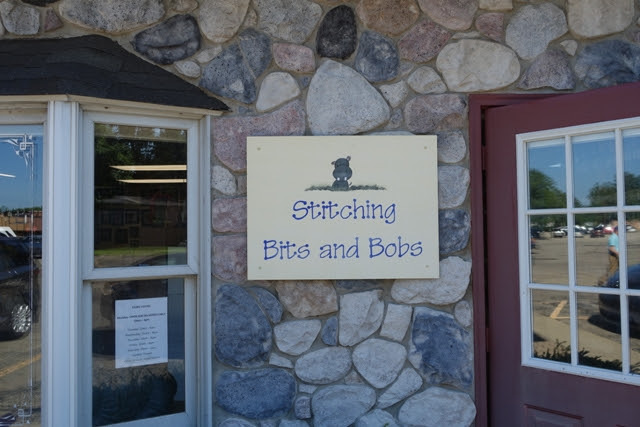 Bobbie: We have a weekly sit and stitch that is open to all. Some of us meet for an early dinner at a local restaurant, The Old Mill, at four and sit and stitch is from five to eight. We are always happy to have people stop in and join us if they happen to be in the area! Me: Is there anything else you would like to say? Bobbie: I think the one thing that surprises most people is that we do not have employees. Cam and I do it all right down to creating and updating our website. My parents helped us quite a bit the first few years and we've had a few temporary employees but we really enjoy working together just the two of us. 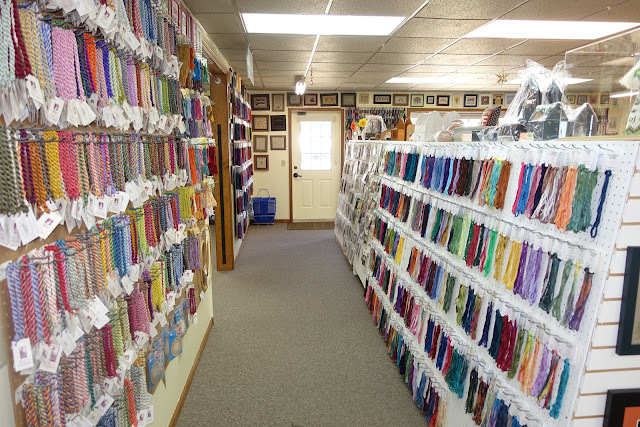 Stitching Bits and Bobs has a large mail-order business with many customers both in and out of the US. They are open Tuesday-Saturday or by appointment. We were at the shop on a Monday which is the day that they play catch-up from a busy week and get ready for the next one. The shop is on my automatic list which means they get my new designs as soon as they are available. Thank you, Bobbie and Cam, for letting us stop by for a visit, especially knowing how busy you are even on your "off-day". Wishing you many more years of continued success with your shop. Blogspot is giving me issues today--no matter what I try, I can't get the font to stay consistent throughout this post. I've finally given up and decided to post it as is. Posted by Ellen at 3:39 PM 6 Notes have made me smile.